boots (pair) black leather and suede sheepskin-lined boots - in the form of black leather Oxford style lace-up 'shoes' and black suede with a sheepskin lining uppers, which are fastened by metal zippers, fitted off-centre, and secured by single leather strap/steel buckle arrangements at the tops. Inside the right boot is a concealed pocket cut into the sheepskin lining, designed to contain a small knife. Soles are of leather. 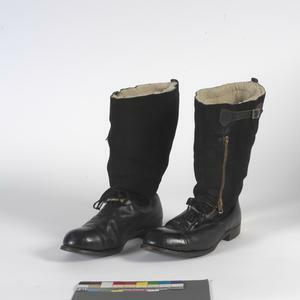 Second World War period Royal Air Force flying boots. 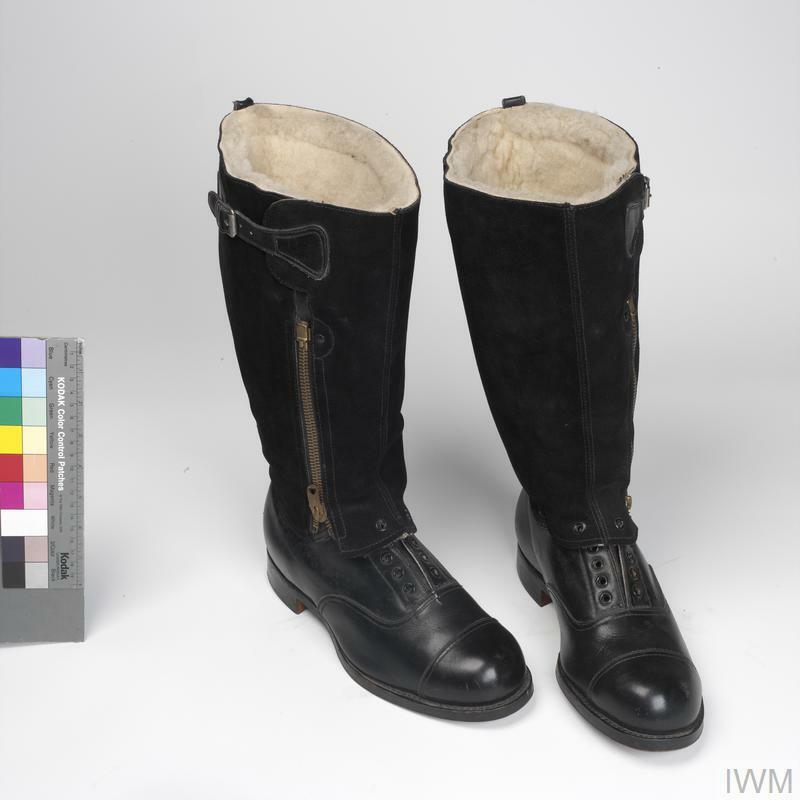 Following on from the pre-war 1930 and 1936 Pattern boots that were used in the earlier period of the Second World War, a further four patterns were developed during the conflict. The 1939 pattern (22/C 225-233) was a one-piece boot with a black leather shoe and brown/khaki canvas calf section with sheepskin lining. This was the pattern worn by the majority of Royal Air Force aircrew, until the introduction of the 1940 Pattern boot (22/C 435-442). This comprised a one-piece rubber soled, brown suede sheepskin-lined boot with a zip-fastener. However the 1940 Pattern proved to be unpopular with fighter pilots: boot was so loose when worn that 'downed' pilots often found that their footwear would fall off whilst descending by parachute. 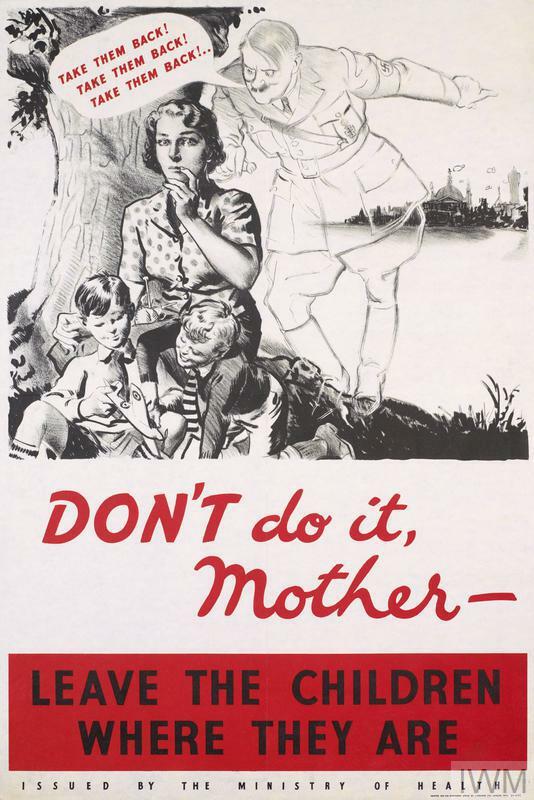 As a remedy, leather ankle straps were fitted to the boots and they were redesignated the 1941 Pattern (22C/748-755). In spite of this modification the boots still remained unpopular for the same reason. 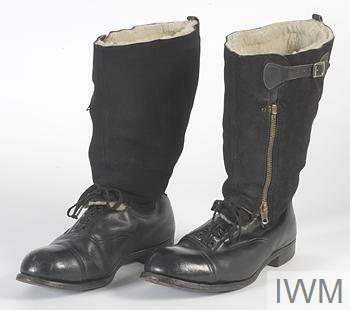 The 1943 Pattern 'Escape' boots were the version produced and were based on the designs of Major Clayton Hutton at MI9, being field-tested as early as 1942. Consisting of a black leather laced walking shoe and a black zip-up suede legging, the basic principle was simple: in the event of landing in enemy territory, the wearer would separate the leggings from the shoe by using the folded pocket knife that was held in the pocket in the right boot. It was believed that the walking shoe would be less conspicuous and more comfortable than a conventional flying boot for an attempted evasion. The design remained in service with the RAF until the mid-1950s.